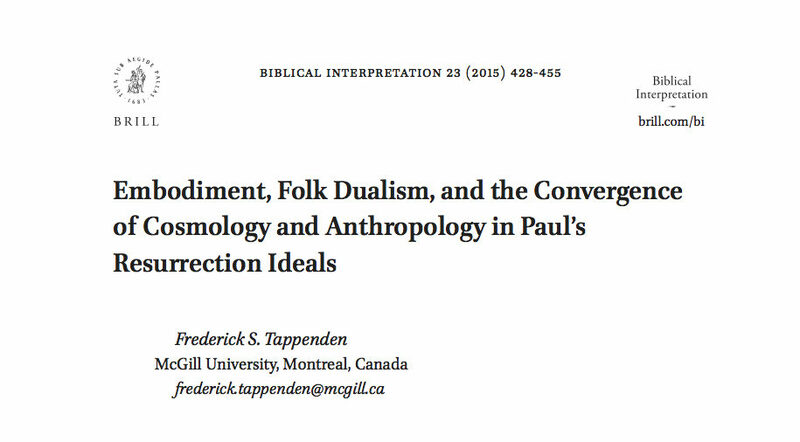 “Embodiment, Folk Dualism, and the Convergence of Cosmology and Anthropology in Paul’s Resurrection Ideals.” Biblical Interpretation 23 (2015): 428–55. While scholarly treatments of Paul rightly understand his cosmology and anthropology as interconnected, two disjunctive tendencies are seldom reconciled. On the one hand, there is a general trend toward viewing Paul’s cosmology through the lens of a Jewish apocalypticism that is dualistically configured; on the other, Paul’s anthropology is usually seen as essentially monistic. This paper redresses this dualism/monism incongruence. By locating Paul within an overlapping matrix of Jewish and Greek traditions of antiquity, we can see the apostle as working within a dualistic framework that is characterized by partitive interrelation rather than opposition. This argument is conceptualized and articulated with an eye toward notions of folk dualism, which cognitive scientists suggest is a natural by-product of human embodiment. Attention is specifically given to 1 Cor. 15:30–50, where Paul envisions a risen existence that is cosmologically and somatically fashioned vis-à-vis such integrative tension.